At Divi Resorts, we believe healthy habits should be learned early in life! That’s why we proudly support educational programs that promote healthy lifestyles to children and families. 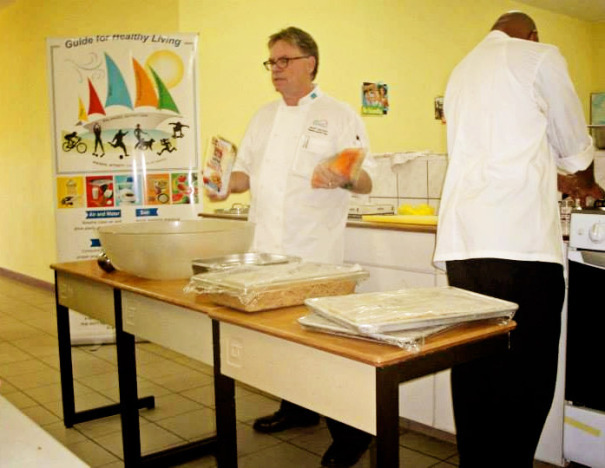 Chef Matt Boland, our Regional Executive Chef, is extremely passionate about this cause, so he happily volunteers his time to a wonderful program on Aruba that educates local students about health and nutrition. Chef Matt participates in an educational program through Ibisa, an Aruban government agency that encourages healthy lifestyles on the island. Through the program, local schools were able to build greenhouses for growing their own vegetables, herbs and greens, and Chef Matt has been visiting these schools to teach the students how to use the ingredients they have grown. He also talks to the students about all aspects of health, from eating fresh, nutritious foods to staying active through physical activities. Chef Matt’s enthusiasm about this subject keeps the students he visits engaged, and he leaves them with a wealth of knowledge about the importance of a healthy lifestyle. We’re proud to have Chef Matt on our team and greatly appreciate everything he does for our island community!